This article is about the geographical plain between Greece and North Macedonia. For the political unit in North Macedonia, see Pelagonia Statistical Region. Pelagonia (Greek: Πελαγονíα, Pelagonía; Macedonian: Пелагонија, Pelagonija) is a geographical region of Macedonia named after the ancient kingdom. Ancient Pelagonia roughly corresponded to the present day municipalities of Prilep, Mogila, Novica, Krushevo, and Krivogashtani in North Macedonia. Map of the Kingdom of Macedon with Pelagonia located in the northwest districts of the kingdom. 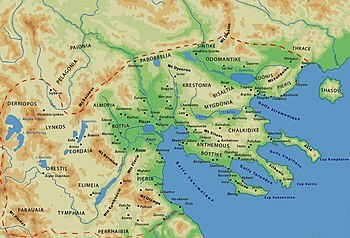 In antiquity, Pelagonia was roughly bounded by Paeonia to the north and east, Lynkestis and Almopia to the south and Illyria to the west; and was inhabited by the Pelagones, an ancient Greek tribe of Upper Macedonia, who were centered at the Pelagonian plain and, according to Hecataeus (1 FGrH 107) and Strabo, were an Epirote Molossian tribe. The region was annexed to the Macedonian kingdom during the 4th century BC and became one of its administrative provinces. In medieval times, when the names of Lynkestis and Orestis had become obsolete, Pelagonia acquired a broader meaning. This is why the Battle of Pelagonia (1259) between Byzantines and Latins includes also the current Kastoria regional unit and ancient Orestis. Strabo calls Pelagonia by the name Tripolitis and names only one ancient city of the supposed three in the region; Azorus. Two notable Pelagonians include the mythological Pelagon, the eponym of the region, who, according to Greek mythology, was son of the river-god Axius (modern Axios or Vardar river) and father of the Paeonian Asteropaeus in Homer's Iliad. The second one is Menelaus of Pelagonia (ca. 360 BC) who, according to Bosworth, fled his kingdom when it was annexed by Philip II, finding refuge and citizenship in Athens. Today, Pelagonia is a plain shared between North Macedonia and the Macedonia in Greece. It incorporates the southern cities of Bitola and Prilep in North Macedonia and the northwestern city of Florina in Greece; it is also the location of Medžitlija-Niki, a key border crossing between the two countries. Many Mycenaean objects have been found in the area, such as the double axe, later found in Mycenae and are exhibited in the Museum of Bitola. ^ Strabo 9.5: For in consequence of the renown and ascendency of the Thessalians and Macedonians, those Epeirote, who bordered nearest upon them, became, some voluntarily, others by force, incorporated among the Macedonians and Thessalians. In this manner the Athamanes, Aethices, and Talares were joined to the Thessalians, and the Orestae, Pelagones, and Elimiotae to the Macedonians. ^ John Boardman and N. G. L. Hammond. The Cambridge Ancient History Volume 3, Part 3: The Expansion of the Greek World, Eighth to Sixth Centuries BC. Cambridge: Cambridge University Press, 1982, p. 284. ^ Bosworth, A.B. "Philip II and Upper Macedonia", CQ, 21 (1971).